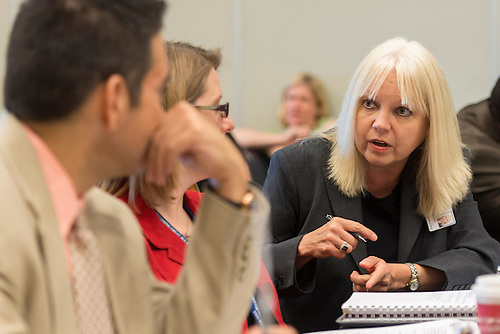 Dr. Susan Szachowicz knows a thing or two about turning around troubled schools. The retired educator was still a teacher at her alma mater, Brockton High School, in 1999, when the campus was dubbed a “cesspool” by local media as one of the worst-performing schools in Massachusetts. This entry was posted in Literacy, Special events, Teachers and tagged summer leadership institute on July 1, 2014 by HISD Communications. An individual’s ability to acquire knowledge is usually contingent on one simple fact: whether or not he or she is literate. Without the ability to read and write with ease, even the simplest of concepts can remain stubbornly—and maddeningly—out of reach. That’s why HISD has made this critically important topic the focus of its annual Summer Leadership Institute. The Institute got started this year on June 17 at the NRG Center, and the district’s Literacy By 3 movement—which aims to have all students reading at or above grade level by the end of third grade—was in the spotlight. This entry was posted in Literacy, News and tagged summer leadership institute on June 17, 2014 by HISD Communications. Are you planning to attend the Summer Leadership Institute this year? This entry was posted in Special events and tagged summer leadership institute on June 10, 2014 by HISD Communications. Have you registered for the 2014 Summer Leadership Institute, which will be held June 17-19 at Reliant Center? If not, now is the time to do so — it’s eTRAIN course No. LD0336. This entry was posted in Summer programs and tagged summer leadership institute on June 2, 2014 by HISD Communications. Whether it applied to building solid relationships between Team HISD members or making the most of tools from the Digital Age, “connection” was the common thread that tied many of the break-out sessions together on the final day of HISD’s 2013 Summer Leadership Institute on June 20. 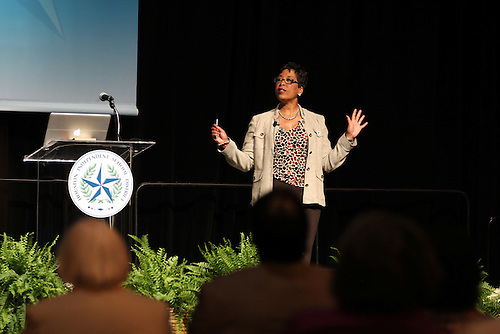 Hundreds of campus leaders took part in the three-day event at the Reliant Center this year, and many came away with new insight into how the concept of “connectedness” could help boost student achievement. This entry was posted in Special events, Strategic Direction, Teachers and tagged summer leadership institute on June 20, 2013 by HISD Communications. Teachers and administrators need to work with students’ families in order to truly better their lives, said the keynote speaker at Wednesday’s Summer Leadership Institute. Karen Mapp, a Harvard University professor and consultant with the Department of Education, spoke to a packed hall of district and campus leaders during the second day of one of the district’s largest professional development events. This entry was posted in Special events, Strategic Direction and tagged Family engagement, Karen Mapp, summer leadership institute on June 19, 2013 by HISD Communications. Campus and central office leadership teams are gathering at Reliant Center for three days of professional development at the 2013 Houston ISD Summer Leadership Institute. This year’s theme is “Becoming Great All Over … The Connection Between Rigorous and Consistent Instruction and School Safety,” and attendees took part in a number of breakout sessions designed to show how those concepts intersect. This entry was posted in Special events, Strategic Direction, Teachers and tagged summer leadership institute on June 18, 2013 by HISD Communications. 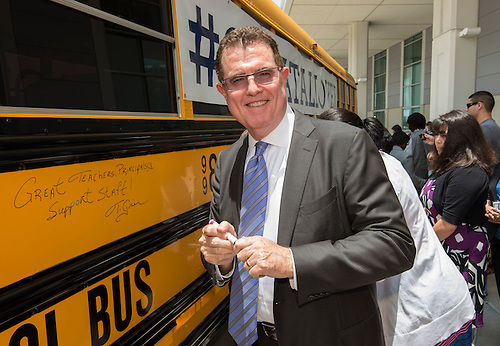 Houston ISD Superintendent Dr. Terry Grier smiles after writing a message on a bus during the Summer Leadership Institute at Reliant Center, June 18, 2013. During the first day of the HISD Summer Leadership Institute, Superintendent of Schools Terry Grier challenged principals to share what they can do every day to help their staff, their school, and their students to “become great all over.” Instead of writing their thoughts down on a piece of paper, however, the school leaders grabbed paint pens and “tagged” an HISD school bus parked in front of Reliant Hall. This entry was posted in Special events, Teachers and tagged summer leadership institute on June 18, 2013 by HISD Communications.